Chakra is the sanskrit for "disc" or "revolution". This seeks to describe a centre in the body within which energies or forces turn, driven and fed by elemental powers which permeate everything. They are sometimes called "energy centres". This idea is first recorded in some of the Hindu Upanishads, a loose collection of about 200 texts. It likely originates in early medical models akin to the humoric concept of the ancient Greeks or Ch'i in traditional Chinese medicine. Rather than being associated with types of material in the body, they are linked with locations in the body and the organs and structures in those regions, for instance the celiac, epigastric or solar plexus (a plexus is a complex of fine fibres or tubes). What are Chakras used for? They are used in meditation as focal points for attention, this being said to alter the flows of energies between the different sources from their unattended states. As in the humoric system, the imbalance of such flows either indicates or is the cause of malady. Thus the process of balancing them is considered both healing and diagnostic. Sanskrit letters are associated with the seven, and can be used for this type of focusing. Many or most systems have them emerging at the front and back of the body. They are connected up the spine, generally but not always in a straight line up the backbone, perhaps with curved connecting lines in wave-like patterns: these patterns are likely another modern addition. Various connective topologies are suggested. Each chakra has petals or spokes radiating from it into the body. These are sometimes described as subdividing and connecting with minor chakra. They have become associated with colours of the spectrum, with red the lowest up to violet at the top of the head. The number of chakras is highly various in different traditions, but the number of main chakras seems to be fairly consistent at seven, with the occasional exception such as Vajrayana (Buddhist Tantra), which divides the lowest and second highest in two and adds one between the throat and heart, giving ten in all. The seven are mapped to the seven perceived colours of the rainbow. The seven seeming bands are an artefact of the human visual/cognitive system and thus a cultural universal. However, these colourings are not used in ancient illustrations and would not seem to work in the Vajrayana arrangement, which perhaps suggests this is a recent, Western addition. Early texts had varying numbers of main chakras from five to twelve, but this converged to seven later on. How do I learn more about Chakra balancing? 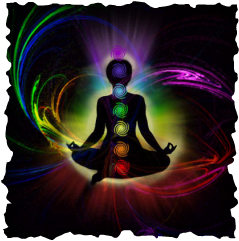 If you are interested in learning more about chakras, and chakra balancing, please contact us for details about training and courses. This is a special guided meditation to balance your chakras, which are the energy centres in your body. When your chakras aren't balanced or open, this leads to health and emotional problems. Sit back and relax, listen to the soothing sounds and be healed in mind, body and spirit. Once your chakras are balanced this file puts you into a deep relaxed meditation and then leaves you to listen to the soothing sounds as you relax deeper. You will wake from the meditation when you are ready. The file is 47 minutes long. Try the chant below to help balance your chakras.